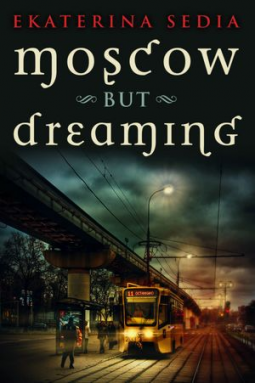 ‘Moscow but Dreaming’ by Ekaterina Sedia is a collection of 21 short stories that excellently capture her range of work. This is her first collection, though most have been published before, with only two new to the public. For those who haven’t yet read anything by Sedia, this collection works well as an introduction, showing her many topics of interest and styles, as several pieces are written from different points of view, placed perspectives, and different focuses for attention. The introduction by World Fantasy Award-winner Jeffrey Ford is also interesting, though possibly better read at the end of the book. Sedia is known for her take on twisting the mundane into something more fantastical, with heavy calling to Russian history, folklore and lifestyle, and displays her way with words with most of her shorts being only a dozen pages long. These aren’t lacking, instead they leave you with sudden impact. A reoccurring topic is that of the ocean, with the starting piece titled appropriately, another being of a daughter of the ocean spurned by a man of the land, and another being of seals. We also meet zombies, vampires and other spirits not so commonly named (though even the zombies and vampires are known otherwise) and overall it is a refreshing take to see folklore of other countries so easily accessible. Most characters are somehow accessible, despite what their issue or trouble may be. We see the human side of them all – even when they’re not human – and each are easy to sympathise with. Several of the stories may not be appropriate for young ones, but some can be shared and this is encouraged, to give them that taste of something not so Disney or softened. Anyone a fan of ‘The Bronze Horseman’ by Paullina Simons – in reading of Russia and that time, rather than the romance – would probably enjoy this collection. Thank you to Prime Books and Net Galley for this electronic copy.